Ultrasound is high frequency sound (which cannot be heard by the human ear). It is used widely in medical imaging to identify structures within the body, specifically blood vessels in the vascular laboratory. The high frequency sound waves are sent into the area of the body under examination through a probe, with the use of some gel which allows the waves to be transmitted across the skin surface. The sound waves then bounce from structures inside the body and travel back to the probe on the skin, and are then processed by the ultrasound machine to create pictures of the blood vessels. 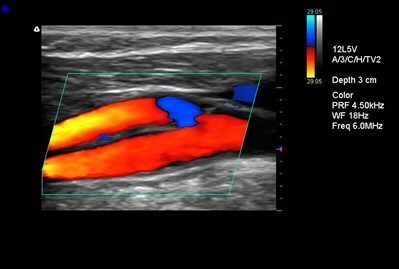 With the use of special ultrasound technology called Doppler, the blood flow within the vessels can also be investigated. Will I be going into a 'tunnel' for my scan? NO. We have no ‘tunnel’ scanners in our department. You will simply either sit or lie on one of our examination couches for your assessment, whilst a Vascular Scientist uses an ultrasound scanner with some cool gel on the site your doctor has asked us to look at. Will there be any needles involved in the test? NO. All our tests are non-invasive, no needles involved. Who will be doing my scan? Your scan will be performed by a Clinical Vascular Scientist/ Screening Practitioner. Yes. There is no evidence that diagnostic ultrasound has produced any harm to patients in the four decades that it has been in use. What will happen to my results after my scan? Your results will either be sent to the doctor who has referred you for the test, or given to you to take to the doctor if you have a follow up appointment the same day.